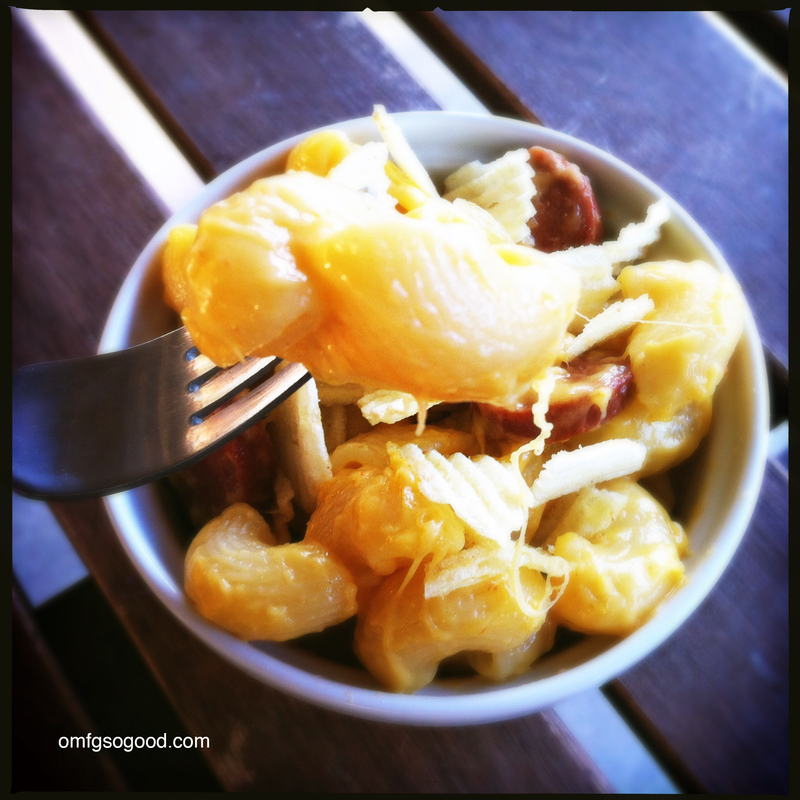 ballpark mac n’ cheese | omfg. so good. I know, I know. With New Years Eve just around the corner I should be posting recipes that will help you stick to some sort of ‘resolution’. Sorry, I can’t. 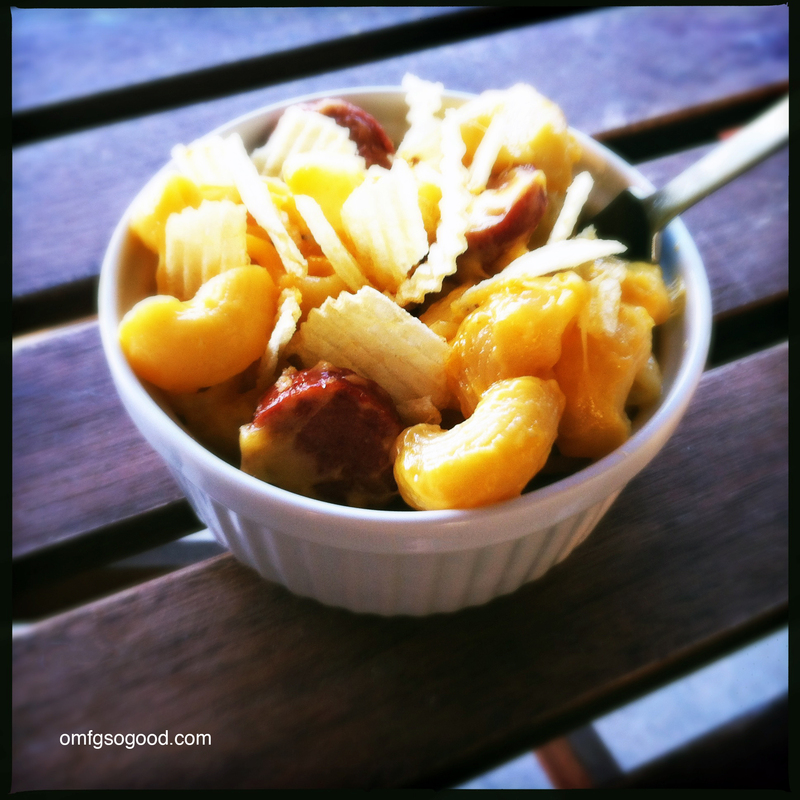 Seriously though… scratch made mac n’ cheese is one of the first things my Mom taught me to make. The base recipe is so amazingly easy and versatile it’s hard not to love. 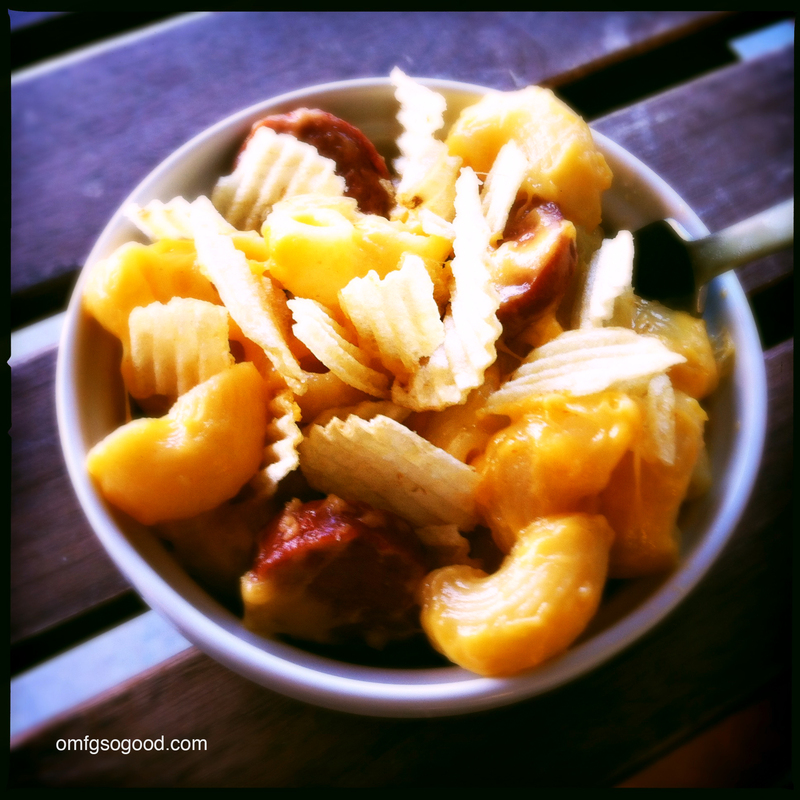 This version features a combination of gooey colby jack cheese and sliced beef kielbasa, baked then topped with irresistible Ruffles potato chips. Totally reminiscent of my favorite ballpark foods. Trust me, it’s a crowd pleaser. Preheat oven to 350 degrees. Cook pasta according to package directions to al denté, drain and set aside. In a large saucepan, melt 1 tbsp of the butter over medium heat, add the sliced sausage and saute to slightly brown/crisp. Transfer to a paper towel lined plate and set aside. In the same pan, melt the remaining butter, add the flour, salt, garlic powder and dry mustard and whisk until well blended. Gradually add in the milk and whisk to combine completely. Add in the hot sauce and continue cooking over medium heat to thicken, stirring constantly for around five minutes. Reduce the heat to medium-low and add in the shredded cheeses, stirring to melt completely. Add the sliced beef sausage and cooked pasta then toss to coat. Transfer to a casserole dish, top with an extra sprinkle of cheese and bake in the preheated oven for 20 minutes. Remove from the oven, spoon into individual serving dishes and top with lightly crushed Ruffles chips. Finley thought this was the perfect meal to finish an afternoon of hitting me with Whiffle ball line drives. Hell, what can I say…for a picky eater, the kid’s got pretty good taste.